Expected price of Lenovo Z5s in India is expected to be Rs. 14,490. Lenovo Z5s Expected to be launched on 17th April 2019. 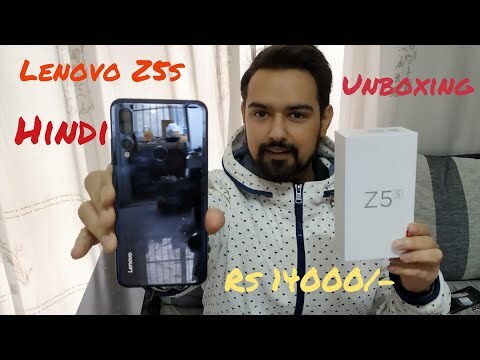 The 256GB / 4GB variant of Lenovo Z5s costs around Rs. 14,490 and expected to available in Silver, Dark Blue and Midnight Black colour. The Lenovo Z5s is a budget smartphone offering by Lenovo that comes with all new generation specs and features to deliver the best possible user experience. The smartphone has a splendid notch display that gives more area for multimedia consumption. The powerful processor and ample RAM ensures a lag-free environment and a decent multitasking experience. The hardest also packs excellent cameras that can make anyone set it with for long photo sessions. The Lenovo 5Zs rocks a 6.39-inch IPS LCD panel with a resolution of 2,340 x 1,080 pixels resulting in a fairly high pixel density of 403 PPI. The screen also sports a water-drop notch carrying the front camera. The screen quality is good with high contrast ratios and nice viewing angles. The smartphone sports a 16MP sensor as its main camera capable of shooting brilliant photos. The front camera is also a 16MP selfie shooter coupled with a LED flash. The powerhouse of the device is an average 3,300mAh Li-Ion battery that provides ample power back up and also supports fast charging feature. The Lenovo 5Zs is powered by Qualcomm Snapdragon 636 processor with the highest clock speed of 2.2GHz coupled with 4GB RAM and Adreno 616 GPU. The combination delivers an impressive performance in day to day tasks and is even capable of sustaining intense multitasking. The Adreno 616 GPU handles the gaming requirements and can run heavy games too but with an average frame rate. The device comes with 64GB of inbuilt storage that can be expanded up to 256GB using a microSD card. It also supports all connectivity options like Bluetooth, 2G, 4G LTE (India Compatible), VoLTE (Works with Jio), 3G, WiFi.